First Certificate Masterclass se zamìøuje na vysoce motivované studenty, podnìcuje jejich samostatnost a pomáhá s nápady pro psaní a mluvení. - pracovní sešit, verze neobsahuje øešení. Sleva platí do vyprodání zásob. Uèebnice First Certificate Masterclass se zamìøuje na vysoce motivované studenty, podnìcuje jejich samostatnost a pomáhá s nápady pro psaní a mluvení. 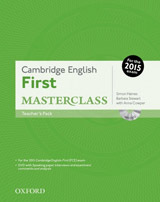 The contemporary design and updated material in this revised edition will motivate students preparing for the 2015 Cambridge English: First exam. The exams skills training activities and tips give students confidence when approaching FCE tasks. The Student’s Book includes access to an online practice test, as well as Online Skills Practice, to give learners plenty of support outside class. Prepares students to tackle the 2015 exam with confidence – Every lesson features clearly labelled exam practice activities. These are supported by handy tip boxes, to help students work through the tasks. Lively and motivating – Photographic unit lead-ins challenge learners to think, and stimulate discussion. ‘Over to you’ sections get students interested by encouraging them to personalise the language. Support outside class - The Online Skills Practice and online practice test are automatically marked, saving time for teachers and giving students instant feedback on their answers. The LMS functionality allows teachers to instantly see students’ results in the online gradebook, so they can identify weaker areas to focus on in class. 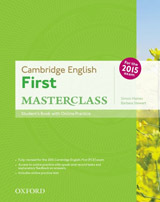 Grammar Reference and Writing Guide – Provide extra support at the back of the book. Review sections – These give students more exam-style practice at the end of every unit. Teacher’s Book – Includes a Speaking DVD showing students doing a mock Speaking exam, which teachers can play to reassure their class about what to expect on exam day.